The Wyoming landscape in Grand Teton National Park is stunningly beautiful. This range often represents the entire Rocky Mountain range in countless photographs, postcards, and imaginations. This section of the Rockies is a wondrous playground for climbers, hikers, skiers, photographers and nearly all other outdoor enthusiasts. Today, two picturesque barns highlight Mormon Row. Settlers John and Thomas Alma (T.A.) Moulton built these barns on adjacent homesteads. After nearly 30 years of working the land, John replaced his log home and barn with a new carpenter-constructed, pink stucco frame house and impressive, two-story gambrel barn north of Antelope Flats Road. South of John’s homestead, T. A. took over 30 years to build his gable-with-shed style barn. Photographers from around the world stop by T. A. Moulton’s barn to capture this iconic historic structure with the Teton Range in the background. Moulton’s barn also called the old Mormon barn is located about 1.5 miles north of Moose Junction in Grand Teton National Park. Photo Advice: Sunrise and early am hours are the best time to photograph most locations in the Grand Tetons. The same is true for the Mormon homestead area and Moulton's barn. Arrive early to this popular location to assure yourself the best setup location. In my opinion the best time of year to photograph the Moulton Barn is April as the mountains are still covered in snow but the foreground grass is just starting to sprout. However, I feel July is the best time of year to photograph Grand Teton National Park as a whole. The reason I recommend visiting the Tetons in July is the snow melt from the mountains raises the water levels in and around the Snake River creating popular reflection pools. If you visit in July this will allow you to still photograph the Moulton Barn as well as other popular locations such as the refection pools at Schwabacher's Landing. 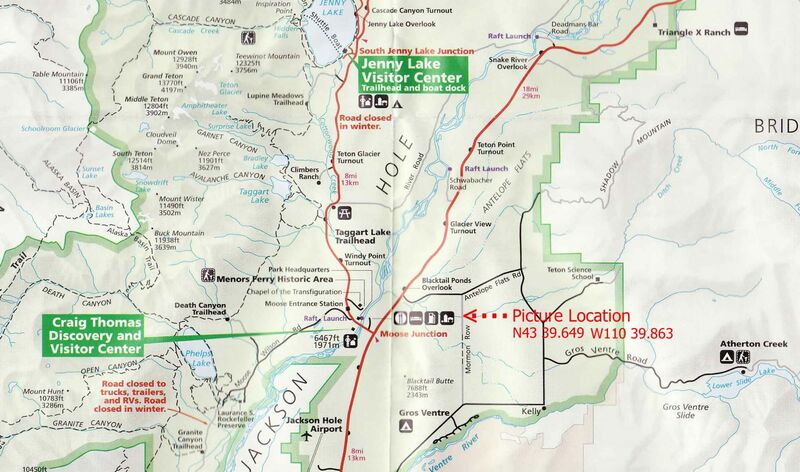 Driving Directions: From US-191 N/​US-26 E/​US-89 (about 13.5 miles north of Jackson, Wy.) turn onto Antelope Flats Rd. After turning onto Antelope Flats Rd the Morman homesteads will be 1.7 miles straight ahead. The popular Moulton's barn will be on the right side of the road and the secondary homestead will be on the left. This location requires minimal route exploration and is marked on the downloadable map. Select the green “View Map” tab to view this location on Google maps. Enter your starting point for detailed driving directions. Download a free copy of the Four Factors of Filter Highlight Photography in PDF format by selecting the “ebook download” tab above. This 37 page guide covers how to take a single image and apply minor manipulations that will help you produce consistent reproducible results. You will also learn the processes of camera set-up, image editing, and advance scouting techniques used by professional photographer Christian James. Free park maps, tide tables reports, ebooks and additional information can be found under the Maps and Resource tab located in the black bar at the top of the screen. The best time to photograph this locations is sunrise. Nikon D3x 24-70mm Lens @ 70mm f11 @ 1/250 second ISO 160 Exposure Value -2.0 with a 3 Stop (0.9) Soft-Step Spilt ND Filter. 5/8/12 5:05 a.m. This photo was taken between Moulton Homestead and Moulton Barn.